Marrakech---Algerian director Bourlem Guerdjou's new film, 'Zaina, rider of the Atlas', has been screened in Marrakech popular square Jamaa Lafna, grouping thousands of viewers. The screening of this big-hearted entertaining adventure was scheduled during the 8-day Marrakech International Film Festival, which will close on Saturday with a special one thousand and one night evening. 'Zaina, rider of the Atlas', which had not met the expectations of its director and producer when screened in France due to the sociopolitical crisis the 'Molière country' has endured lately (France riots), has received warm welcome and admiration in Morocco. Bourlem Guerdjou, the film director told Morocco Times that the movie is a turning point of his life since his ambition has always been to shoot an adventure film about emancipation and self-affirmation. 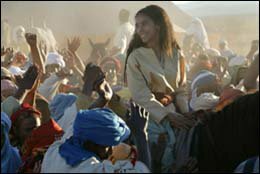 “Zaina, rider of the Atlas recounts a generous, universal fable directed at all audiences,” said Guerdjou. This out-of competition film revolves around a trio of characters, two men and a girl: three people, who are stirred by strong emotions, but share a common destiny. “The challenge of bringing this project to life will be to listen to the heartbeat of the intimate interactions between the characters. Another challenge lies in the spectacle element. In this jubilant adventure, chase sequences, uncommon battles and surprise attacks link up in a sustained rhythm,” Guerdjou explained. The beauty and brutality of Morocco's Atlas Mountains, the complexity and rectitude of human relationships make Zaina, rider of the Atlas at the juncture of two traditions, the western and oriental tale. The treatment of the image of the film better expresses this union. As its director described it, Zaina, rider of the Atlas is a combination of the lyricism of the western with the magic of the fairytale. “This is finally a profoundly humanistic film. It portrays characters who confront one another. Proud, these characters fight in dignity for their freedom and refuse to enslave themselves,” explains Guerdjou. Zaina, rider of the Atlas tells the story of Mustapha, a nomad, accompanied by the best horsemen from his tribe in Morocco's Atlas Mountains. He has to lead a caravan of precious thoroughbreds to Marrakech in time to take part in the most prestigious race, the Agdal. But before confronting the daunting challenge of crossing the Atlas Mountains, the nomads stopped in a town to pick-up Mustapha's wild 11-year daughter, Zaina, whom Mustapha did not even know she existed until the recent death of her mother. The tension between Zaina and Mustapha is palpable from the start, each as stubborn and wary as the other. The nomads and the child flee into the awesome immensity of the Atlas landscape with Omar El- Mansour (her father's rival) and his men hot on their tracks. Over the course of this dogged pursuit across a hostile landscape, father and daughter have gradually become attached and began to understand each other. Zaina who, heartened by Mustapha's passion for horses, will test her own talent by running the Agdal herself, vanquishing Omar's bitterness and hatred, and winning over the praise and admiration of her people. Most who have seen Zaina, rider of the Atlas say it is an entertaining big-hearted adventure film. It underscores the stages of an apprenticeship and revolves around the theme of legacy and filial love. It is also a human contemporary film about emancipation and self-affirmation.